This is where you submit custom boards for Ranked PvP play. If you post custom boards in this thread, we'll consider them for inclusion in future PvP board rotations. WHAT IS A PVP BOARD ROTATION? Every month, Ranked PvP uses different boards, usually a set of 3 or 4. For that month, each ranked game is played on one of these boards. Example rotations: Celestial, Tezkal, Manor. Your own work! Please don't submit boards which use substantial portions of other people's work worth without their permission. Right now, we are only looking for single board submissions, not entire rotations. Talk to @Flaxative if you have an idea for an entire rotation. • At least 3 spawn points per team. • Spawn points of opposite teams should either A) be 9+ squares away from each other, or B) not have line of sight to each other. 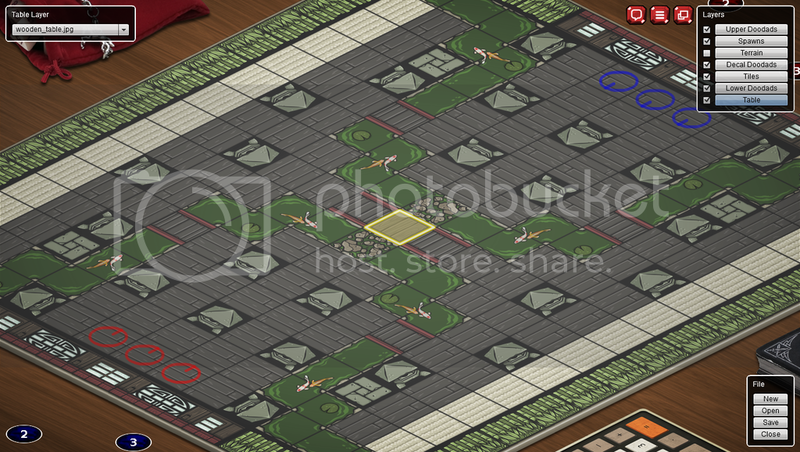 • Boards need at least 1 square of victory terrain. More is encouraged. • Avoid creating boards where Round 1 Flash Flood or similar has a high chance of ending the game. • No player-specific victory terrain. • Boards shouldn't be too big. 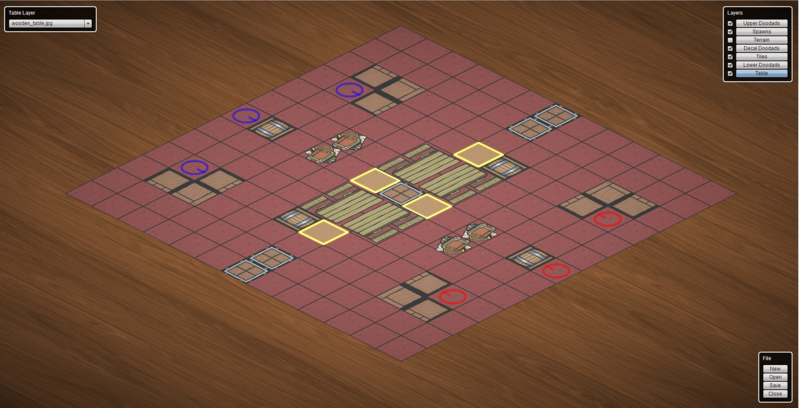 There's no hard number associated with this, but please try to fit the playable portion of your boards inside a 13x13 grid. Please, just one submission per post. You may submit as many times as you have new boards to submit. WHAT DO YOU LOOK FOR IN A BOARD? We look for fun, originality, and polish. 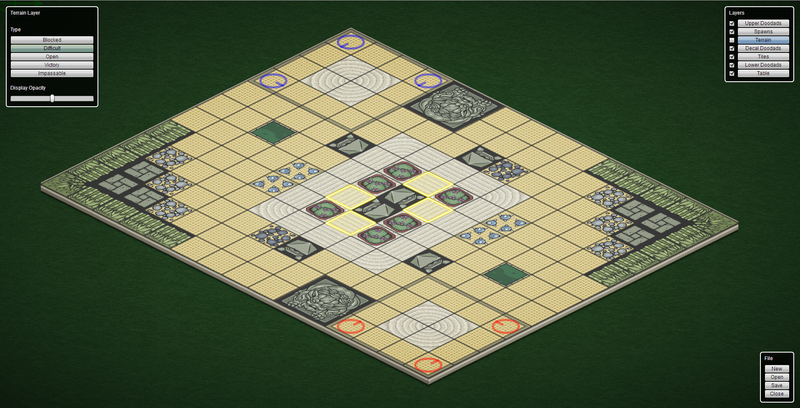 • Fun: Preferably, your board is not one-sided for any class or race and allows players a number of viable strategies. Bonus points if you create terrain formations that encourage currently rare play styles. • Originality: This is relative what's already in the game. We don't want boards that are simply reskins of existing Ranked PvP boards. Please only submit substantially different boards. • Polish: The more polished your board is, the less work we'd need to do if we wanted to publish it, and the more likely we are to go with it. WHAT MIGHT PREVENT A SCENARIO FROM BEING PUBLISHED? The first is use of external intellectual property. We don't want to get sued, so if you build a board called "The Face of Mickey Mouse", where the board is in the shape of Mickey Mouse's face, then we aren't going to publish it. The second is the use of unreleased content. Occasionally you'll see new content (like tilesets and decals) become available for use in the board editor before we release any new adventures or multiplayer boards that use them. Boards that make heavy use of these will likely not be considered for Ranked PvP play until that content is used in our own work. We may go back and reconsider those boards in the future. We might make minor changes to your submissions before publishing them. In most cases these would only be cosmetic. If a board can't be published as-is (misses one requirement, is horribly broken in some way), but has a good idea behind it, Blue Manchu staff may work with you to improve it. We don't have a fixed schedule for releasing custom PvP Ranked boards. In fact, we may not publish any submissions, depending on the quality and quantity of submissions. The purpose of this thread is to establish an official channel for submitting this kind of content, in case we decide to use it in the future. When we publish your work we will credit you by appending your forum name to the board title, unless you request otherwise. Also we will try to notify you by forum message before the build goes live. There're a couple threads with examples of custom ranked boards—some good, some bad—and the feedback those boards' creators received from their peers may be instructive. See Stexe's thread, and Tuknir's thread. Depending on a board's performance once it's published, we may pull it or modify it at any time as necessary. IF YOU'RE NOT POSTING TO SUBMIT A BOARD, DON'T DO IT IN THIS THREAD. winner, Sir Veza, Xayrn and 5 others like this. Guess I'll submit my old maps that I made. I might clean them up again slightly, but here you go. The names are pretty placeholder so I'd be interested in suggestions from others. winner and Potato Priest like this. Info: "Pub Brawl" by Gnizla. Description: As the sun raises you leisurely get out of bed and enjoy a cup of coffee. You are at peace with the world...that is until you realize that someone has occupied both bathrooms, you will be next in the queue no matter what it takes! winner and Drakkan like this. What's the stance on boards with player-specific victory terrain? winner and Xayrn like this. Description: You are stranded on a desert island a face a difficult decision: fight the other sailors for treasure, or light a fire in the hope that this beacon will attract the attention of a ship that will come to your aid..
You know, even though it doesn't quite fit the guidelines I really like the design of "Stranded" as-is. Unlike Celestial Lions, it's really easy to stick any character's head out from behind the rock to attack. Even if all you have is Walk and a step attack, you can make it. I would suggest moving the south victory square up one, and the north down one. Even if that still isn't in Dash range , if is within Walk +Stab or Walk + Step range. Note it isn't within two Walk distance but you could Walk + Fly 2. Thanks, and yes I agree with comment suggestion and incorporated it! winner, Stexe, Juxtapostion and 1 other person like this. winner and Stexe like this. I keep trying to submit a screenshot but the file is too big. What is the file size limit? The limit is 1 MB. Convert it to .jpg and you should be fine. winner and Juxtapostion like this. I wanted a board where's every character separated and threatened from the start. The team has to get together first. One of the victory spots was broken. winner and timeracers like this. Description: The sand awaits the blood of the fallen. Might be a nice addition to the Zen rotation. timeracers, gulo gulo and Juxtapostion like this. Run for the throne... How I hate those stairs! Description: Two parties face-off to summon a powerful demon, whoever evokes him rule the realm. Descriptions: six brave adventurers find refuge from a blizzard in an ancient dwarven furnace, but there are only four fires, so someone's going to have to go!! Potato Priest, Xayrn and uhlik like this. Description: Ski down the mountain through the beacon shrines and reach the victory squares before your opponent does! Can I eat those mushrooms? This board focuses on constant movement (for a better cover, improved shooting angle and for the victory points of course). billiska and timeracers like this.